Albert Heijn is operating the Asian food pop-up store under the name 'Chop Chop'. Albert Heijn has opened a pop-up store in Antwerp that focuses on Asian cuisine. Shoppers can try seven different Asian dishes and buy the ingredients needed to prepare them. The pop-up store will be open until 28 October. According to local press reports, the Ahold Delhaize operation intends to expand the concept to other locations in Flanders, the Dutch-speaking part of the country, if the test is deemed successful. Over the last couple of years, we have seen many retailers opening pop-up stores. Even Aldi Süd and Lidl have done it; and just like the discounters, Albert Heijn is using the temporary store to demonstrate its food expertise. Interestingly, this time the retailer is not focussing the marketing stunt on its home country, where it operates an impressive network of stores, but on neighbouring Belgium. Ahold opened the first stores under its Albert Heijn-flagship banner in Belgium prior to its merger with domestic retailer Delhaize Group. It operates less than 50 stores in the country, all of which are in the Dutch-speaking region; and the company has still not decided how to proceed with them. The retailer has stated that it will come to a decision in early 2019. Opening a pop-up store – with the potential of more to follow – presumably to convince Belgian shoppers of its food expertise, could be part of the process of considering whether it is worthwhile to continue operating the Albert Heijn brand in the market. An integration into the Delhaize network would also sound sensible and could be more efficient – particularly if the Dutch chain’s brand value is significantly lower. 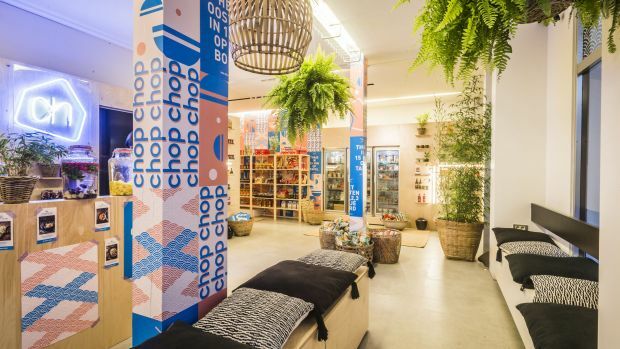 The Antwerp pop-up is named Chop Chop and above the shop there is a huge Poster with Albert Heijn’s logo and the slogan “Asian Food by Albert Heijn”. We suspect there might initially be mixed feelings when shoppers see a Netherlands-based supermarket chain tapping into an area that is usually reserved for locals; for operators of corner shops and restaurants that are originally from the region that the chain intends to excel in. The supermarket store operator has indeed decided to showcase its knowledge in dishes that originate far from its headquarters in a small city near Amsterdam. The intention behind this is probably to prove to customers: we understand international cuisine, this is just one example, come to our store to see how we do in other areas that might surprise you. Asia would seem to be just the right culinary region to make this point as despite the fact that it seems to still be a niche in European supermarkets, it is also the largest continent in the world. Albert Heijn makes use of this fact by not only focussing on the typical recipes that Belgian shoppers would expect, such as fried noodles. Yes, there are spring rolls on the menu, but also dishes from Thailand, Indonesia, Malaysia and Vietnam. It will be interesting to see whether the Ahold Delhaize banner will further roll-out the pop-up concept, as this would be the first indicator on a potential decision regarding the future of Albert Heijn Belgium.